I have been reading background documents at Basel.int, the website of the Basel Convention Secretariat. I found a paper published by a consultant in a rapidly developing, high tech "Asian Tiger" country, which had some definitions for e-waste in the section on imports. One of the legal thresholds in all environmental enforcement is trying to decide when something is a waste, and when it is a commodity. If you need one computer, and I send two half computers (which you make into one), is that a waste transaction? If I send two fully working computers, but you only asked for and needed one, which of the two is a waste? on date is a waste. Think about that. Most of us use a computer for at LEAST two years. We may actually have bought it 6 months after the "manufactured on" date. If you spend a little time before taking it to the recycling center, another few months can go by. The recycling center might go a month between collections. Next, the recycler has to wipe the drive, check it out, to make sure it's good. Then the recycler needs time to assemble a full containerload. It takes several weeks to get the sea container over the ocean and into the port. This definition creates a de facto world with NO SECONDARY MARKET. Think about that. Who benefits from used cars, used clothes, repair shops... who buys in the secondary market? Who is this new standard purporting to help? I see a lot of young people with a fervent desire to save the rainforests, enlist in the green army, preserve the environment. I am still at one with that mission. But there is no excuse for friendly fire in this war to save the planet. Aim your guns at mining, aim your guns at bushmeat, aim your guns at whale hunters. This war on the used and secondary market is against the solid waste hierarchy, against the poor, and when we look back on this decade, the people who lied and said that 3 year old computer exports are ewaste are going to be just as guilty as the "Waste Makers" who plan obsolescence. "Is anybody there? Does anybody care? Does anybody see what I see?" I risk becoming angry and polarizing myself from environmentalists. We really need some professors and grad students to come and lift the lid on this arrogant white man's burden war on the poor BS. Last night we posted about California SB20, the "Perfect is the Enemy of the Good" poster child on e-waste. They defined "cancellation" to mean "ruin" a monitor, depriving the state system of reuse income, and creating a shortage for certain monitors - often filled by exporters willing to send "toxics along for the ride". This follow up post is for people willing to POSITIVE SORT (not negative sort) computer monitors. We need certain cream of the crop monitors (8% of 2009 sample). We are at capacity to accept the other monitors, and we will not tolerate screen burn, scratch, glass damage, etc. Positive sort means "if in doubt, leave it out"... there are more monitors in surplus than there are in scarcity. This PO is perfect for California. All these monitors are completely refurbished into new housing, so they would be the same as monitor glass remelted into a new monitor... but by retaining the reuse value, we save California taxpayers. This Purchase Order [PO], for THESE SPECIFIC MONITORS, has a shortage of several thousand - about $35,000 per month that we could be paying California. What we need are for Good Recyclers who are destroying (out of fear of the "export market") to take a closer look and see if they can pay someone to positive sort and take these good monitors out of the recycling stream. Click picture to advance to more sample photos. Here is a description of the makes and models we typically see (there are some others, especially Samtron, but this list is good for training purposes). If you have seen these monitors being destroyed for recycling, please contact us immediately at www.WR3A.org! For a $350 annual membership, we will audit your CRT trail and represent your loads to EPA and clients. The membership will pay for itself in the first 100 monitors! When a 5 year old computer monitor is turned in as "e-waste" in California, the collector gets paid to deliver it to the recycler. Once the collector has been paid by the state SB20 fund, the recycler has to reimburse the collector the state collection fee if they choose to repair (or plug in and see if it still works) and resell the monitor. If on the other hand, the recycler breaks the monitor into little pieces of glass and plastic and metals, the recycler gets a check from the state. Surprise, surprise, guess what the recyclers do? Old or new, working or repairable, smash smash, grind grind. The result is a huge pile of CRT glass which recyclers in the state currently cannot find a good home for. When they do move it, the CRT glass is probably sent to India or Malaysia, where there are three things - CRT furnaces (still melting glass and mined ore to make new CRTs), CRT assembly factories (which put the CRTs into housings and circuit boards and make monitors and TVs), and demand for new monitors. Lots of demand. People who earn $3000 per year (about 3 billion people) are increasing access to internet at 10 times the rate in the USA. On those salaries, they need cheap and they want it to last a lot longer than LCDs do. As for the recyclers, they don't get paid by the state until they prove "cancellation" of the monitor. Cancellation is not defined in the statute, the definition is left to the regulator agency, and the regulatory agency defines cancellation as breaking of the vacuum of the CRT gun. In other words, ruin the monitor, change it from something Malaysia will pay $5 for into $1 worth of scrap. Once the vacuum is broken, the thing is just leaded glass. Cancellation was not defined in the Electronic Waste Recycling Act. The concept of cancellation is referred to in the Act, as amended, see 42476(e) & (F):"
cancellation method authorized by the board." So the Board wishes the CRT to be broken into pieces, shipped to Malaysia or India, where it is remelted, at great carbon expense, into a new CRT tube. It is then assembled there into a new monitor. But the factories which assemble those new monitors have to pay $85 for a minted new CRT tube. They would rather buy, and refurbish, a used CRT from California, for $5. Same country, same monitor factory. But CA now gets $1 for scrap, and the monitor factory pays $85 for the new CRT. Why can't California processors sell the still-useful CRTs, with 10 more years of life, for $5? Because of the Board's definition of "cancellation". Here is a slide show which shows how California can save a lot of money, and also save money to young med school students in India who can't afford a brand new monitor. When I first presented this idea, in 2005, it would have saved the state about $1M per MONTH. The demand is now down, but it could still save millions per year. No surprise if you read our blog. Developing countries have their own "ewaste" they are generating. This report sums up our "fair trade" philosophy, which is that if the developing countries are going to import from the USA, it should be nice stuff they can refurbish or they should be fully paid to recycle it properly. Either one is what builds the capacity they need to manage their OWN electronics waste. Las Chicas Bravas (Retroworks de Mexico) shows how fair trade of electronics waste recycling can be empowering, create good jobs, and build the capacity for those nations own TVs and computer scrap recycling. Even Al Jazeera agrees... see below. I have written in the past about the "cancellation" rule under California's E-Waste bill, which required computer monitors to be ruined in return for a big subsidy (between 35-48 cents per pound, 3-5 times the market rate in the rest of the country). It starved the Asia refurbishing market from 2002-2008, when India, China, and others hungry for affordable internet were creating a secondary and refurbishing economy which was actually larger than the USA market for new computers in the 1990s. The market insisted on being fed, and when California removed good monitors from the system, the demand was filled by recyclers in the East, too many of whom mixed junk CRTs into the loads, like the load filmed by CBS 60 Minutes in the "Wasteland" segment in November 2008. What is the other legacy of SB20? There is a massive CRT glass pile in Yuma, Arizona. But that pile is smaller than most mining piles and certainly less hazardous. There is not that much of the 48 cents per pound that went into the raw material accumulation. Where the money went is into processing. California SB20 Processors like ECS and ERI had plenty of subsidy to destroy CRTs and no incentive to visit or meet with refurbishers in Asia. They became E-Steward champions... living in a state which had virtually no exporting, and with no market incentives for exporters, they were friendly the the BAN vision of zero exports. It fit the business model they already have. Meanwhile, CRTs are a finite resource, and in my visit to California and CRT processors last month, I learned a dirty secret... There are not enough CRTs being collected in California to feed the beast. California created a massive shred-and-destroy infrastructure, and now that business is hungry for CRTs. They are getting them from Arizona, Nevada, and Oregon. That destroys the markets in those states, and bankrupts California (the California Integrated Waste Management Board, which administered SB20, was dissolved and downsized last year). With less management oversight from CIWMB, the CRTs collected from programs in Arizona have fewer people to spot the fraud, and California loses more money. This hits our Arizona and Mexico refurbishing investments. I think the CRT business will be all over in the next 3 years. But this blog will tell a story about well meaning environmentalists and unintended consequences. In December, the industry periodical "E-Scrap News" of Portland, Oregon, reprinted a piece from our November Blog (originally titled, "We Shouldn't Have to Make that Choice"). The theme of my editorial was that BAN had not done enough to encourage reuse, and was standing by while "E-Stewards" went on thinking that the Basel Convention calls for "tested working" electronics (it does not) and that export for repair and refurbishment was banned between OECD and developing nations (it is not). E-Scrap News printed a response editorial in January which summed up many of the objections Jim Puckett made to my original post (filtering them fairly, I'd think). BAN correctly chided me for confusing E-Stewards, Pledge Signers, and E-Certification companies (though I am not the only one confused - and as it turns out, there are no certified companies at all to date). In my opinion, BAN muddled other issues (is a letter to Malaysia EPA saying that CRT glass must be washed "assistance" in keeping the market open, or was it the shot that caused Samsung - which had washing equipment already in Malaysia - stop buying CRT glass?). I hope that one part of BAN's response is read loud and clear. They agree that "tested working" is not in the Basel Convention, and they deny setting a "tested working" standard. They have corrected me, and said that tested working was never in the Convention, and said I was misrepresenting them. This is good news. I hope that E-Steward companies like Electronic Recyclers International, WeRecycle, HessTech, and other reputable companies which have refused to ship perfectly decent computers and monitors when their "tested working" programs are at capacity will take my original point - the perfect is the enemy of the good. In each case those refusing to ship for repair and refurbishment have said that their BAN Pledge allows only tested working units to be exported. The correct response to scumbag exporters who disguise "toxics along for the ride" as "export for repair" is simple. 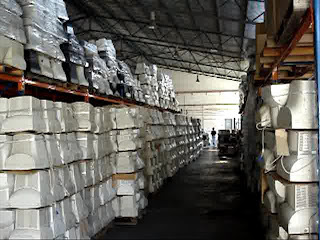 Sell to the same buyer, the factory in Indonesia or Malaysia. Sell better equipment than the exporter for less money. Beat them at their own game. The alternative, shredding up your own repairable equipment, despite the massive repair capacity, massive demand, and massive environmental benefits of these reuse and refurbishment companies, is cutting off your nose to spite your face. The demand doesn't go away, it is just forced to buy lesser quality loads for more money. And the cycle continues. BAN has offered some olive branches along the way. But I am forced to confront them that there continues to be massive confusion about the export for refurbishing market. BAN's clarification that any parts or pieces which might be replaced must be removed BEFORE export for repair (something not in the Basel Convention) is a hornets nest for the tested working market - a lot of tested working equipment is also upgraded overseas, as is surplus (new in box but surplus and outdated) equipment. The MPPI, the Basel Secretariat group which tried to come up with rules for export for refurbishment for cell phones, does little to clarify the market for CRT monitors (a "ping" test for telephones has nothing to do with the specifications of what must be removed by WR3A purchase orders). So as it stands, BAN has said the discussion with WR3A is over. They have admitted that export for refurbishing CRTs is explicitly and directly stated to be a legal market in the text of the Basel Convention. But they have left the water muddy and directed Pledge Signers to a document about cell phones. The attached photos, by the way? When I was visiting new markets in Asia, I found a really nice repair and refurbishing shop in a modern shopping mall. The owner had a dozen such shops, and was making deliveries to each one, where they repair and resell modern computers from a USA location, driving to each of his stores, and unloading a single sea container at each one. The owner showed me the BOL. It was from a Pledge Company. BAN has asked me to disclose which member it is. I see no reason to do that, the buyer was happy with the material, they were doing the repairs and refurbishment. I do not object at all that this company exports. What I object to is that I tried to sign the Pledge and disclosed this market and was refused entry as a Steward. When I said other Pledge companies ship there, I was told that I still could not, but that they'd kick the other companies out if I told on them. That's exactly the opposite of what Fair Trade is about. My experience is that there is a generation of humanities graduates who established nonprofit credentials on the free market's weakness - consumption of natural resources. That generation, now in our 40s-60s, was able to parlay the loss of rainforest, toxics fears, and general unease over disposal and planned obsolescence to rebound and regulate your industry. They are behind ideas like "coffee boycotts" and "export bans" and ROHS (replacing recycled content lead with mined tin and silver, and shortening electronics product lifespan in the bargain through tin-whiskers). I'm hopeful. There is a new generation - my company has recruited several undergrads and grads - who is genuinely open-minded, still even more concerned, about the environment. They are more than willing weigh the science. After all, they are going to live through the mistakes. They understand the concept of "unintended consequences," "self inflicted wounds" and "friendly fire" between environmentalists. They are sick that we spend billions to collect fluorescent lamps, diverting the mercury from lined landfills and sending it to alleuvial gold miners in the Congo and Amazon rain forests. Make no mistake, these are not neo-conservatives. They do not like the status quo, which is not sustainable. But the "sustainability" people are the friends of ROHS leadfree engineer/victims. By rephrasing the endpoint from "non-polluting" to "sustainable", they have opened a thousand thesis researchers who are willing and eager to discover that "antidote B causes, rather than cures, blindness"
Here is a video of how the electronics made with "leadfree" solder have shorter lifespans, which undoes the environmental benefits (also undone by the fact that tin and silver are horrendous mining situations compared to lead, which is about 80% recycled content from lead acid batteries). My read, at age 48 a lifelong environmentalist, is that "environmental health" or the "health of the whole ecosystem" is parallel to the study of human health. Which is superior in Western Medicine. Which took root in alchemy. Just as the best doctors medicine could afford fed liquid mercury to King Edward of Britain (as I understand, it improved his bowel movements, aka waste flows). The research over what killed rather than cured the King is the genesis of dialectic and university research, which wrestled control of the hospitals from the Church. The analogy is that the eco-priests are prescribing mediocine to electronics industries (the king), and bad effects occur. But the next generation is willing to listen if you all can put your concerns in the form of a thesis topic which can be tested and promoted by a bunch of twenty-somethings who have no more loyalty to Al Gore than the kids in the 60s (my generation) had to C.A. Swanson (inventor of TV dinners, once the rage). My point is that we can channel your anger and frustration into thesis topics. I am working with several universities, via WR3A.org (a "Fair Trade" electronics export organization which fights to reform, rather than ban,export for repair and reuse). Incidentally, I am, for the time being, a completely self-owned recycling company at war with some irrational "environmentalists". I am confident they will lose, just impatient over the amount of time it is taking. Actually dialogue just occurred at the breakfast table with my 9 year old son. Son 9: Papa, how much does a car cost? Me: Depends. A new car or a used car? Son 9: How much does a new car cost? Me: Ok. The cheapest one? Me: The cheapest new car is probably around $10,000. Me: It would probably be more with tires and taxes and stuff, but around $10,000 for the cheapest one. Son 9: Ok. How much for a used car? Me: Well, that depends how old the car is, and whether it's broken or not. You know what everyone in my family did when I was growing up? Me: The farmers in the Ozarks all had to know how to fix a car. And they taught their sons how to fix cars. You know who knows the most about fixing cars in my family? Me: Well, yes he did. But today, I think it's his son, my Uncle Ed. Me: People like my grandfather couldn't dream of buying a new car, but they all knew how to fix cars. So they taught their kids the best thing to do is find someone who CAN afford a new car and buy their broken cars. Then you could fix the broken car for a lot less. Especially if you bought TWO broken cars of the same kind. Son 9: Oh, so you can take the parts off of one and fix the other! Me: Ok, I've told you about that haven't I? Exactly. You know, I think Uncle Ed still has a "parts car" in his yard, even though he owns a company like me and has even more employees. He learned to fix the cars and he still does it. Son 9: Because that's what Hamdy was doing with the computers in Egypt. Me: Right, exactly. He sells computers to Egyptian college students who could never afford a $300 new computer. He buys working ones, he buys parts, and sells them. Son 9: And Hamdy has a company, like you and Uncle Ed. Me: Yes. And you know what? Uncle Ed and Hamdy and I all started our companies because we didn't have another job. We had to. We had to rely on ourselves. That's how companies get created. Son 9: And Mariano does that in Mexico, too. Daughter 13: Papa, you know what some kids at school do at lunch? They take the lunch and when they're done, they throw stuff away, even unopened yogurt that they didn't touch. I hate that. Son 13: Yeah, it's disgusting. Me: You guys have been to Cairo, you didn't see that happening over there did you? Son 13: No. It makes me think of the kid with the camels, Abdullah. He was about my size, but I think he was 14 or 15. He was super nice. He had flies all over him and he was dirty but I think he was really cool and mature. Me: When you see people throwing stuff away, it's good to remember people like that. Ok, so I'm eventually going to be exposed as a doofus dork, and they may eventually become hoarders or become traumatized by their teenage friends for being close to their Daddy's junk business. But no one at the table said "they should leapfrog and get new computers and cars." And no one at the table asked why they don't eat brioche when they have no bread. The free market is a beautiful thing, it is an ecosystem. But we don't want leftover junk cars in my grandfathers back yard, and you don't want leftover junk computers piling up in Egypt and onto Las Chicas Bravas in Mexico. And if you regulate the disposal of certain toxic components in the cars, you don't want people to throw all the toxic parts into a sea container and throw a new Harley Davidson motorcycle on the top and tell them to cover cost of freight. So what you have to do is remove the bad stuff first, make the sale of good stuff conditional on the proper recycling of the leftover bad stuff, and have a part of the money in trade set aside for proper recycling of the leftover stuff. It is about Free and Fair Trade. No farmer I know would accept the condition of take away a car he didn't need in order to get the one he wanted to fix. A ban on exports won't work. Mandating that people cannot buy broken cars and fix them won't work. What you have to do is establish mass balance controls on the haz waste components (we suggest CRT Glass) and audit that bad stuff is accounted for, and you need to establish trade which contractually rewards poor people for taking extra steps that don't pay for themselves, like cleaning up incidental breakage. I am working on two longer posts, hopefully publishable. This will take me some time. But in the meantime here are some interesting sources of information who are, independently, finding the same information I am describing. Adam Minter, "Shanghai Scrap" Blog. What Greenpeace doesn’t know – or prefers that others don’t know – is that during the last two years, several of China’s most notorious e-waste processing zones – including Guiyu – have seen real improvements in their environmental conditions. More significant, where those sites still exist, they are mostly filled with domestically generated e-scrap – NOT imported material. CIMS Director Nabil Nasr, at NY Rochester Institute of Technology, has been studying remanufacturing and reuse markets for a long time. He is able to put dumping, salvaging, recycling, repair, refurbishment, re-manufacturing, and reverse-engineering, piracy and competition through insights, into a very understandable free-market economy theory which I subscribe to. There are many other sources, some UN publications, and a large number of qualified professors who are NOT western, who live in China and Malaysia and India, who are concerned that the pendulum is starting to swing back to far in reaction to the "e-waste export scandal" stories. I will keep linking these together, but the point of this post, is that I am not singing off key, alone in the woods. My friends who believe the story of the export market has been written, and who are investing millions to grind up stuff which the export market is desperate to pay for, will be on the wrong side of history. We hate the bad exporters, too! But we think the best way forward is to improve standards, develop a regime for fair trade, and beat them by supplying better and better material for less. Engineers of "lead-free" electronics have been more concerned about circuit failure than about environmental costs. My own criticism has been that they are replacing lead - 85% recycled content - with silver and tin, which are mining nightmares. If you are going to protect the lined landfill at the expense of the coral reefs and rainforests, then maybe you should use baby seal pelts as packaging - they are organic and reuseable. The buzz in the engineering community is whether "tin whiskers", these pesky little strands that naturally creep away from the printed line of solder, like rust naturally accumulates on iron, are going to short circuit electronics. Several engineers are readying the Toyota recall press daily to see whether Toyota - an early adapter of lead-free solder - is the first casualty. NASA and medical devices and airlines have been seeking "exemptions" from lead-free solder rules. I'll post more when I know something. I am not a grouch. I just want to limit the "friendly fire" of environmentalists. The environment is too dear to endure self inflicted wounds for the sake of political correctness. If our policies are correct, they will be stronger for having endured critiques. What I observed from living both in Vermont and in Arkansas is that a lot of people (I won't say most) who express political opinions are sheep. Most people ( I did day "most") who argue positions loudly and boisterously are sheep herders. They seem to know that if they have the majority already, that by being loud about their position, they maintain their leverage. It is not easy to have a Platonic, Socratic, dialectic political discussion in either place. Rush Limbaugh is the worst example, in my opinion, of a sheep herder. Why would someone take "ditto" as a compliment? You know what is a really, really, really good program for dialectic learning, trying out of ideas? NHPR's Socratic Exchange. I really enjoyed a program inviting dialogue on truth and religion while driving home from Logan Airport. While driving across Texas (from Arkansas to Mexico) I called in to a radio talk show with Bill O'Reilly. He was lambasting the Mexican / Latino immigrants for having higher single mothers. I called to ask wasn't it true that Latinos were more likely to be Catholic and less likely to have abortions, and that perhaps his insinuations on single motherhood had less to do with Latino morals than non-latino abortions. He put me on the radio, then muted me with a button (I guess) and pretended I just wanted to hear him talk. It was shockingly fake. Here's the ANOTHER write up (for you college students out there) on the history leading up to two Certification Programs. I have another chapter I am really anxious to roll out, but I want to have enough history posted on the blog that I can simply footnote. First, here is a description of the R2 Export Certification by the EPA contractor, John Lingelbach, who moderated the discussions between dozens of parties to the Responsible Recycler Certification process. What I've added below is a step by step walk through on the history of the debate. The place it broke down is where it broke down before: when, where, and under what conditions is "export for repair" or "export of non-functioning" used electronics legal? BAN said the Basel Convention only allowed export after the offending circuit or capacitor is removed in an OECD country, WR3A stated that Annex IX allowed it to be repaired overseas if either both Parties considered it a non-waste commodity or if key functions (or something that prevents export of obsolete and unrepairable waste) were tested. What R2 finally formed consensus around is to state that the export MUST BE LEGAL in the importing country. That way, if BAN was right and it was all illegal, R2 Certification would require a legal import permit be provided as evidence of compliance. If WR3A was right and some countries have legal export for repair markets, then the permits would be found in the audit, if BAN is right, R2 would stand by BAN under the "legal" rule. Why was this simple compromise rejected by BAN? If BAN is right, and Annex IX repairs are not legal except as BAN dictates, then the "legal" condition of R2 covers it. But not everyone agrees with BAN's interpretation. A little history shows how the Basel Convention Annex IX B1110 has been considered by EPA, BAN, and ethical ewaste recyclers, especially regarding the drafting of BAN's "Pledge of True Stewardship" will shed light on the breakdown at R2. BAN gained national prominence by shocking people with photos that showed "cheap recycling" of e-waste, and representing those photos as representative of most e-waste exports.. Whether the nasty practice was described as "often", "usually", or "80%" (no data was ever provided), people were understandably distressed by pictures of poor children living in horrible conditions. Like campaigns over the working conditions of coffee farmers, shoe and textile workers, the press impacted the industry. Companies began to distinguish themselves by their "export practices" (as well as by price). BAN added USA prison labor to their ewaste campaign, which helped them bring aboard some big USA ewaste processors who were competing against UNICOR for federal computer processing accounts. I was as concerned by the photos of children burning circuit boards as your average environmentalist, but wrote a "white paper" in 2002 ("Higher Standards") which complimented BAN for raising the bar, but also cautioned BAN that we don't want the outcome to be more mining and less recycling. The paper was edited and released as an article in Recycling Today. The mining reform activists, such as www.earthworksaction.org, didn't have photos of children in the copper mines, but professional ecologists knew the damage from a recycled ton of copper to be less, no matter how primitive the conditions, than extracting a ton of mined copper, no matter how good the operation. But it was much more difficult to generate a following around the words "standard" and "reform" than it was over the word "export". BAN then came out with their "Pledge of True Stewardship". I seriously considered signing on, but was concerned by two things: 1) the emphasis on "promoting legislation" which no one had seen, and 2) some nuances in the "tested working" standards. I spoke with BAN about the export for repair, and we nearly had a compromise worked out in some footnotes concerning the export for repair market. A third concern then surfaced as companies "Pledged" to meet the standard... companies were joining the Pledge who were known exporters, to varying degrees. My company was not accepted because we disclosed a monitor refurbishing operation which several other Pledge companies also sold monitors to. It was a good operation, and there was absolutely no good served to "outing" the companies which shipped to it. But it was also difficult for BAN to distinguish between companies which shipped to a good reuse operation and companies which exported to villages which sorted out the monitors and shipped them to the same destination. You sometimes had in the same city two USA companies which were exporting to the same port - one was separating out the junk TVs and monitors and handling the glass in the USA, and exporting directly to a factory, and the other was selling mixed monitors through a broker and thus eliminating all the insurance and CRT glass handling expenses. Then BAN made headlines again with a Dell Boycott. They threatened to dump PCs on Michael Dell's doorstop because Dell used Unicor prison labor in its recycling program. Dell's "reform" (or capitulation, depending on who you talk to) and the Dell Boycott became the E-Waste story of they year. BAN was now in a funding cycle which depended on headlines. I tried to work with BAN on opening the Pledge to the companies which were exporting the right way (which would have allowed us to disclose their Pledge companies already doing that under the "tested working" clause which I refused to sign). Sarah and I published a paper together in 2004 using the "CRT Glass Test" as an indicator of good behavior. The CRT Glass Test was simple and effective - take the total tonnage of ewaste collected and divide it by tons of bad CRT glass, the CRTs broken and removed for recycling. The killer aspect of the CRT Glass Test was that the biggest exporters had NO CRT GLASS AT ALL. If you already employ someone and pay the insurance to remove some of the monitors and recycle them, you might as well take all the bad ones and get the higher price for the good ones. The windfall to be made was not in sending a few more bad monitors, it was eliminating the inspection and sorting entirely. I failed to get BAN on board. My take on it was that they appreciated the information and the insider view to the export industry, but that they wanted to set the standard and keep control. But they didn't have any resources to visit the monitor refurbishing operations and see what was going on. And the more I tried to explain about the technical differences between "tested working trinitron R4 CRTs = Bad" and "non-working Corning SVGA CRTs = Good" the more I fell into a thicket of "poor communication". I can communicate some days better than others, that's for sure, but it is much harder to explain that putting a Sony made CRT into a Proview chasis is like putting a Volkswagon motor into a chevy than it is to label something "untested". Several of us who understood the technical standards tried to form WR3A - the World Reuse, Repair and Recycling Association - as a coop of good actors. The idea behind WR3A was like Fair Trade Coffee, if you get enough businesses that dictate a stronger standard, you help bring that standard to scale and make it economical to reform the bad practices. WR3A is still a great concept, but the people who WANTED to join were the people attracted to a simple "Exports are OK" message. The people WE wanted to join, who passed the CRT Glass Test, had already either marketed their Pledge status and either were breaking everythying under the "export bad" slogan, or shipping secretly to the same WR3A factories but did not want BAN to know lest they be removed from the Pledge list. (The worst was the company which was exporting worse loads than WR3A allowed but still listed as a Pledge E-Steward, while putting "EPA Certified" on their website - a certification that never existed). EPA was the next whipping boy for BAN. I don't know whether WR3A can take credit for de-simplifying the Pledge, or if enough other companies were frustrated by a "promise not to lie", but pressure grew for a consensus approach to "certification". EPA hired a professional mediator, John Lingelbach, someone outside the e-waste field, to hold meetings including professionals and non-profits to form a consensus around the standards. Guess which standard BAN walked out over? The same "export for repair" (under Annex IX, B1110) we broke down over in the footnotes to the Pledge. BAN said that if a part was removed under B1110, that the part then became waste, and that the export for repair was only possible if each unit was "prepped" for repair in a process that would have required a repair professional. WR3A advocated an "80/20" rule, showing that 80% of the bad weight can be removed for 20% of the effort, and that getting down to the single bad capacitor (like the one bipassed in our Egyptian repair slide show) was going to kill the economics and drive the demand back to the black market. WR3A was getting more and more technical, learning more about the techniques of CRT repair. Some CRTs have some demand, but cannot be absorbed in the thousands. If you had a legal, ISO14001 factory, price would reflect demand. This makes WR3A a more difficult sell (though it was extremely popular with Asian CRT refurbishing factory executives who know CRTs inside and out). BAN said that repairs, if not done domestically or done to a degree that failed parts had to be removed, was illegal under international law. WR3A said that was not only untrue under Annex IX, but that there were factories permitted to import by the competent authorities. R2 Stakeholders ultimitely voted a very simple compromise - that the export must be legal in country being exported to. If BAN was correct, and the WR3A repairs were illegal, then WR3A exports would not be allowed under R2. I had qualms that people would lobby foreign governments to take away import permits, but that was a qualm I had to live with, and I voted for the R2 standards. BAN walked out. Those of us supporting the R2 Process are confused how BAN says something is illegal if both the importing and exporting country say is allowed as a commodity under certain conditions and enforce those conditions. The MPPI standard, right out of the gate, concedes that to Parties to the convention can make their own determination that a cell phone or a CRT is a commodity not a waste, but that if they do not have this consensus, there is a decision tree to determine whether the item is a commodity or a waste. But R2 had bypassed that by making both parties agree in the first place, and WR3A put its emphasis into giving price incentives to foreign refurbishers to come out of the closet, get legal import permits, and be ready for R2 audits. That is still a gamble in process. Our permit in Mexico (an OECD country where the Basel Convention waste rules do not even apply) to process the bad CRTs was not renewed by the Mexico EPA in the 4th quarter 2009 (until we do additional CRT breaking and recycling permits). We can still repair and disassemble but we cannot use our CRT Glass purchase order, we have to re-export the CRTs to the USA until the permit is renewed. That is more than doable, but we have an $85k grant in limbo, and I don't know if I can personally survive financially for many more months without it. In 2002, I visited some great CRT refurbishing factories in China (having made connections on a consulting trip to China EPA and GEARI). Having seen the huge reuse potential of used monitors (mostly coming from California at the time), I thought that the key problem was TAR - "Toxics Along for the Ride". We visited more factories in 2005, and this time I brought along a native Chinese speaker - UC Davis's Recycling Coordinator Lin King, as well as a neighbor of BAN, Craig Lorch of Total Reclaim. I didn't want to be accused of seeing what I wanted to see, but didn't want to leave this lucrative and highest-value-added and most environmental solution to the scumbags. There were two problems. The first was that I could not on my own supply enough monitors for the factories to stop buying from our "lowball" competitors. 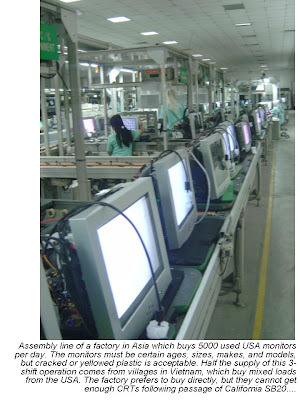 Demand was so high - estimated at 70,000 monitors per DAY at its peak in 2005 - that the factories were happy to buy monitors from both sources, the WR3A members who passed the CRT Glass Test, and the factories that didn't screen the monitors as well. TAR wasn't stopped. The second problem was that the Chinese Communist Party owned the largest virgin CRT manufacturing capacity in the world, having made a major investment to take over CRT production globally in the 1990s. In my meetings with Chinese "competent authorities", they said smashed CRTs for raw materials were ok, but working CRTs were "dumping" in a protectionist / tariff sense (their virgin CRT factories shouldn't have to compete with used CRTs from wealthy nations). That meant I was doing the right thing environmentally by sending the good CRTs to these factories and taking out the bad ones, but I was "closing one eye". The Chinese buyers typically had small import permits for a small number of monitors (80,000 per year for our largest buyer) from a regional office, but they were playing cat-and-mouse with customs. If we got caught with a load of good CRTs at a Chinese port, it would be like drinking a non-alcohol cocktail at a Speakeasy during prohibition... "tell it to the judge". So we went looking for countries to send the CRTs to, and the Chinese and Taiwanese factory owners were doing the same thing. Some of them only wanted to change the country of transit - ship CRTs to Viet Nam for transport by truck overland. But others wanted to make larger investments to "scale up" the monitor factories. I met the CEO of a billion dollar per year company at CES in Las Vegas. His company had supposedly purchased a CRT Glass washing machine from Europe (probably from the Citiraya bankruptcy) and was going to use his return-the-glass contract (from buying new CRTs and sending back incidental breakage for recycling) to Samsung Corning in Klang Malaysia. Samsung was interested in recycled CRT glass because it lowered energy costs (a big concern in 2006), and they hoped to get some environmental credentials as well. The factory owners group gave us a tour of a huge CRT monitor factory which had 1500 employees, they were buying 5000 monitors per day just at that factory. The specs were the same, about 40% of monitors were unwelcome because of the raster or size (putting a trinitron CRT into a thomson case is like trying to put a Cummins motor into a Volkswagon), but they could recycle the glass. I got very excited and started promoting the WR3A hard, and had a lot of dialogue with BAN. BAN was suspicious. They tried to get us to remove the CRTs from the monitor housings in the USA before we shipped, saying that was the only way to be compliant with the Basel Convention. But EPA and the importing country EPA didn't think that, and in fact the fallout (broken, unacceptable) was actually higher in the stripped / pulse-test operations than in was leaving the monitors intact (the USA factory which had been stripping the CRTs discovered the same thing and went to our method of shipping later that year). When it came to R2, I tried to portray the discussions with BAN in a positive light, saying we were trying to solve the same problem, TAR, but approaching it differently. At the R2 meeting, Sarah confronted me afterwards and said BAN did not like the association. Jim at another meeting told a friend of mine from EPA (who didn't disclose she knew me) that I was just another exporter. These two interactions signaled the beginning of a deteriorating relationship between myself and BAN. We had some success signing up CRT suppliers to the WR3A contract. But two problems came up. First, the people who most wanted to join WR3A were the folks who had been exporting practically everything. They liked that we made exporting sound ok, they just weren't committing to take out an recycle the bad CRTs. Some said they could meet our good CRT PO specs, but told us not to ask what they do with the others. We didn't accept their supply. The second problem was that BAN was apparently labeling our "testing" procedures (which statistically result in 95% acceptance) as non testing, and promoting the other method (which was less effective than 95% because of the stripping-and-shipping process). So some good suppliers we initially could buy CRTs from stopped supplying us and went to destruction. BAN said, correctly I guess, that they were still able to ship to us if the suppliers "tested" the monitors to BAN's specs rather than WR3A's specs. The problem was that everyone just started destroying the CRT monitors rather than bother. The biggest example of this - and the one I have focused on - was California SB20, which requires the CRT tube be "cancelled" (the neck of the cathode ray gun broken) prior to export, which ruins every single one for rebuilding purposes. I did not want to give up, and we started adding layer by layer to the "vetting" process for the CRT refurbishing. We got the buyers to give us feedback within 5 days of receipt, via a reconciliation report. We got them to charge us back $4.50 for each unacceptable monitor (damaged in shipping or shipped by mistake), and to recycle the glass at Samsung, and to provide downstream proof of recycling for each part removed or recycled. They got ISO14001 and ISO9000. They even went so far as to invite their nation's EPA to inspect their facility four times per year. In 2008, we sent an R2 Auditor to verify their compliance with the PO, their import permit, etc. I tried to reapproach BAN that winter and was rebuffed. It became a hard year for our buyers in Africa. Greenpeace saw the "ewaste" problem as a fund raising tool and began to compete with BAN for who owned the outrage. 60 Minutes, BusinessWeek, and other bad press for the export market made it hard on our smaller business partners who had the will but not the wherewithal to pick up their game. One of my favorite customers had 3 containers of perfectly nice grade A monitors seized at an African port. We came and diverted the shipment to our vetted factory, and even arranged to supply the African buyer with factory refurbished CRT monitors to get back into the game. The PO worked well for 2008 and 2009. Our Asian partner actually became a CRT glass recycler for their home country. Then the enforcement by China began. At first, that was great by us, we had left the Chinese "Speakeasy" market and were operating in a 3rd country, transparently and legally. The fines by USA EPA started to fall on the folks who were going cheap and easy to Hong Kong. We were bullish and started to solicit more monitors than ever, and we got more people than ever willing to meet our specifications. Unfortunately, Hong Kong was an "end of pipe" enforcement. We should have realized what would happen next - 80 containers per week diverted from Hong Kong, hitting the streets in the other countries including the hometown of our factory. The PO that paid WR3A $3.50, $7, and $10 per screened and tested monitor became a handicap to our buyer. The same CRTs were available all over town at a street price of $1.50, diverted from Hong Kong and from USA "recyclers" who had been enforced against. We made two plans. First, move the factory to Mexico. Mexico is an OECD country, and more importantly, eliminates the Panama Canal and Pacific ocean shipping for our buyers in Africa. Second, we drastically reduced the pricing to our regular buyer, at much pain and discomfort to our USA suppliers, who were dealing simultaneously with more and more expensive CRT glass recycling in the USA. I went for financing and asked BAN if the move to Mexico would be welcome. We had a short and friendly dialogue. Then my critique of the E-Steward Tested Working standard came out, and BAN got very upset. We tried to salvage it, but the ricochets still ping through the internet. Last week, there was a post in Toxics Alert which named me and my company. I was traveling in CA, trying to meet the UN purchase order for working equipment in Africa and trying to get help for Mexico. Our $85k grant for CRT recycling on the Mexico border was frozen, and bridging the price disputes between our Asian buyer and WR3A suppliers became more difficult. This is an extremely difficult way to try to do the right thing and not make any money doing so. The WR3A members who went to breaking CRTs are still afraid to face BAN's wrath and are breaking CRTs. EPA has gone to radio silence, I know their enforcement team is at work, and we are proceeding based on full disclosure. If our factory import permit is taken away, this will all go to hell. I just spent a few thousand dollars flying around the USA to meet with suppliers, meet with buyers (the UN program) and to shore up legal and transparent shipments of TVs, which are coming out our gills. BAN continues to misrepresent what WR3A factories are doing legally, and E-Stewards remain confused about the repair and refurbishing market. By the time all of this gets fixed, who knows if there will still be a need and use for CRTs? Having lived in Africa, I think there is. Laptops and LCD screens disappear too easily and don't last long enough. CRTs work, they are big and bulky and dependable, and there is a strong repair culture for them established in the developing world. Will we every find common ground with BAN? Well, I will always take offense when a competitor who exports twice as much gets away with "pledging" his duties down. I think we have to go to PACE at the Basel working group and make our case there.